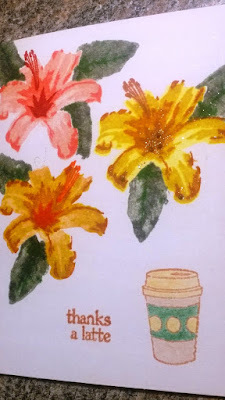 All My Love Crafts: The Start of this Summer's Coffee Lovers Blog Hop! 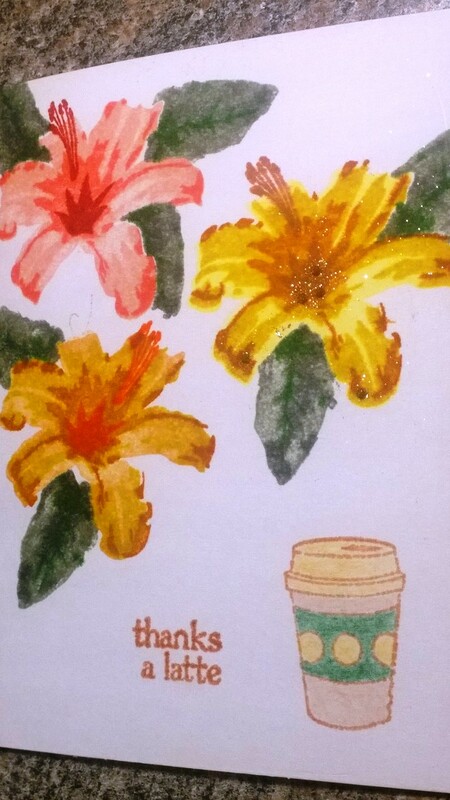 The Start of this Summer's Coffee Lovers Blog Hop! This Summer's Coffee Lovers Blog Hop kicked off yesterday on June 17th and will run until June 24th! As one of my all-time favorite online events, I had to create some cards! For my first card, I pulled out a new stamp set called Layered Lily. For ink, I used Tim Holtz Distress Ink Mini Pads. Colors used include: Tattered Rose, Spun Sugar, Worn Lipstick, Fired Brick, Squeezed Lemonade, Scattered Straw, Mustard Seed, Wild Honey and Orange Marmalade. I like how the ink bled a little to create a pretty watercolor effect. 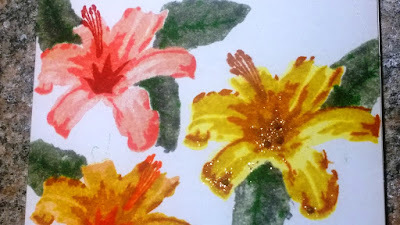 May try another card using different inks! This cute latte cup and the quote are from Fiskars Latte Love stamp set. And, of course, had to finish one lily with a couple drops of multi medium matte and micro fine stampendous gold glitter. 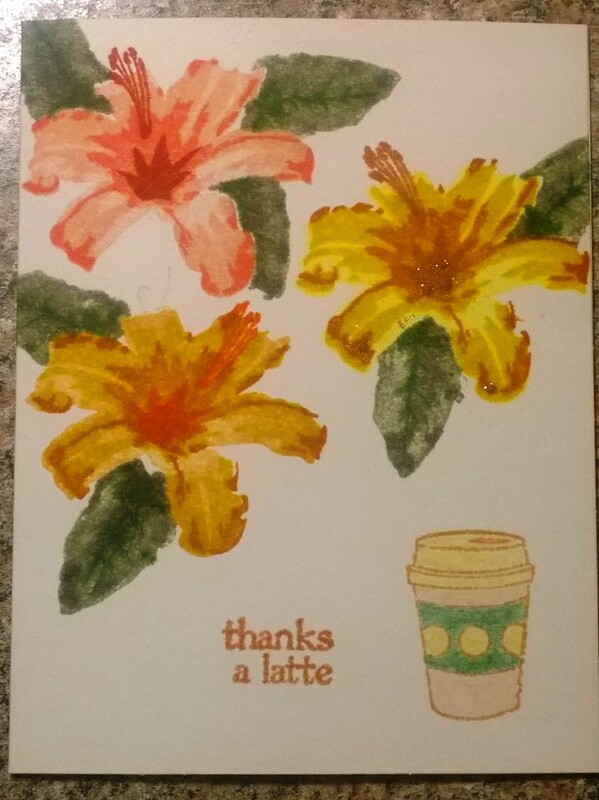 Love the watercoloring affect and the flowers are pretty...great job. Your card is SO very pretty!! Very pretty! I am just getting on the water color bandwagon. It's a lot of fun trying different techniques. I'm just lovin' the layered stamps out there and actually worked with a set today. Love your card too. Your flowers are lovely. Great card. Thanks for sharing. So pretty Annie, I love those flowers! Happy hopping and enjoy your summer! Annie, love the cups teamed up with the large tropical blooms. Wow, so artsy and gorgeous! Beautiful! The flowers are gorgeous! Those big tropical flowers really feel like summer! These beautiful flowers look handpaionted and go perfectly with a good cup of coffee. The flowers look like they are real and ready to jump off your gorgeous card!! Love it!